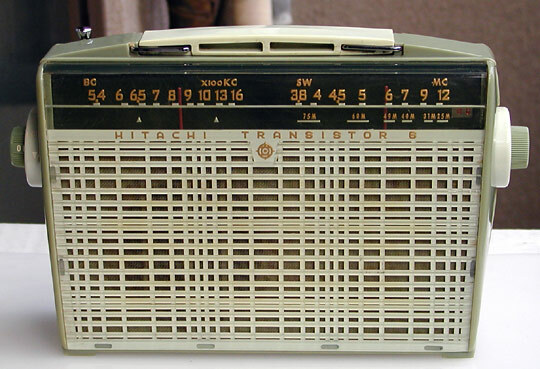 Meet the WH-667 "Judy", Hitachi's first 2-band radio that went on sale around the middle of '58. The unit shown on this page is green with a pale green handle. I love the design of this big monster. The rounded shape that grows wider toward the top is a riot, the practical handle design makes it easy to carry, and the entire face is made of a single sheet of reverse-painted plastic, including the asymmetrical lattice speaker grille. Another interesting feature is the double-layered knobs on each side. The smaller green knob protruding from the left side is the power switch, while the larger grey coloured ring is the volume control. On the right is the band selector switch surrounded by the larger tuning dial knob. Lots of fun. "Judy" is one class act!